Sherman? Smithsonian? Old Governor’s Mansion? MILLEDGEVILLE!!! One of the Picky Peaches, Susan, has a book called 1000 Places To See Before You Die-USA Edition. 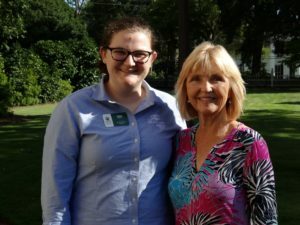 When our Hidden Gem Restaurant Challenge took us to Milledgeville, Susan discovered that her book listed The Old Governor’s Mansion as a place to see. So we added this beautiful historic home to our trip. Wow! We weren’t disappointed to say the least. 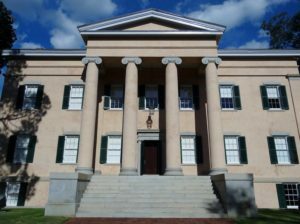 If you’re looking for an interesting day trip from the Atlanta area, we suggest you check out Milledgeville – Georgia’s Antebellum Capital. In our previous blog post, we reviewed the yummy Aubri Lane’s restaurant, so you know a good place to have dinner. 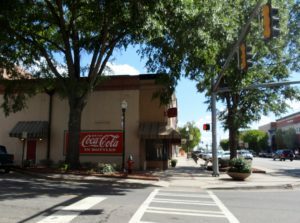 You may not be aware that Milledgeville served as the capital of Georgia, before it was moved to Atlanta in 1868. Situated adjacent to the Georgia College and State University campus, is this important example of Greek Revival architecture. This National Historic Landmark served as the governor’s residence from 1839 until 1868. Are you wondering how the Mansion is still standing, since it was directly in the path of General William T. Sherman’s March to the Sea? Well, Sherman claimed the Mansion as a prize and used it as his headquarters on November 23, 1864. Governor Joseph E. Brown received word that General Sherman and his troops were coming, so Governor Brown and his family packed up much of the furnishings and sent them to their farm several miles away for safekeeping. After General Sherman left, they retrieved the items. 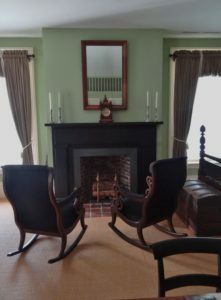 Thanks to their efforts, the Mansion still contains many of the original furnishings. Following the war, when Georgia’s state capital was moved to Atlanta, the Mansion was abandoned. Given to Georgia Normal & Industrial College (now known as Georgia College and State University) in 1889, the Mansion was its first building. It even served as a dormitory at one point and there’s still graffiti visible on an interior window frame. In 2015, the Old Governor’s Mansion was named an affiliate of the Smithsonian Institution. Due to this affiliation, the Mansion occasionally will have special exhibits on loan from the Smithsonian. When we visited, there was a special exhibit relating to President Abraham Lincoln’s election campaign. It was every bit as hotly contested as today’s presidential campaign. We encourage you to tour this captivating home, so full of history that you can feel it in the air as you go through each room. 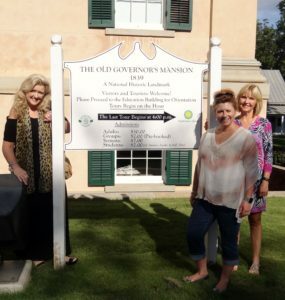 Getting there: Approximately 2 hours from Atlanta, the Old Governor’s Mansion is located at 120 S. Clark Street. You can’t miss the large, peach-colored stucco home with stately columns. Turn in the driveway and park in the small, gravel parking lot. You’ll see signs for tickets at the gift shop near the rear of the house. Tickets are $10 for Adults and $7 for Senior Citizens. Hours: Tuesday – Saturday 10 a.m. until 4 p.m. Sunday 2 p.m. until 4 p.m. Closed Mondays. Tours are guided by friendly GCSU students and begin at the top of the hour. The last tour begins at 4 p.m. Be sure to wear comfy shoes. If you have a few minutes to spare, stroll around the well-manicured lawn, which contains several southern favorites including magnolia, azaleas, fragrant tea olive and camellias. No matter what time of year you visit, something should be in bloom. It’s impossible to describe the beauty and the history of the Mansion in this blog, so you’ll just have to see it for yourself. Psst! The very clean, modern restrooms are located inside the ticket office and gift shop building. Don’t forget! Tell them you saw it on PickyPeaches.com! If you aren’t interested in seeing this historic home, you can certainly get your shopping fix in downtown Milledgeville. There are about ten antiques shops selling everything from fine antiques to simple glassware, just like your grandma had. If antiques aren’t your thing, there are boutiques too. No matter what you decide, Milledgeville is worth a visit. Check in with us next week, when we share one of our favorite peachy recipes.